So here we are again – Manchester City face Leicester City in the Carabao Cup quarter-final round just a day shy of the one-year anniversary of the same fixture at the same stadium in the same round of this competition. Hopefully the feeling of déjà vu doesn’t extend to it lasting another 120 minutes before a shootout is needed. Fielding a weakened XI, City needed penalties – and Riyad Mahrez missing Leicester’s decisive spot kick – to beat the Foxes last year en route to lifting the Carabao Cup. A win tomorrow night would move Guardiola’s men closer to claiming the trophy yet again. Leicester are stuck in 12th at the moment but only 4 points behind 6th-placed Manchester United, so hopefully they decide to weaken their team, because otherwise they may see this cup as a big opportunity. With fixtures piling up and a number of injuries lately, Guardiola would want to rotate heavily tomorrow night, but claimed he may not have enough fit players to make too many changes. The availability of everyone except Danilo (who would be a shoo-in for this game) seems clear enough, with no further update offered on the often-injured right-back. Sergio Aguero and Kevin De Bruyne are fit again, Fernandinho returned at the weekend, and John Stones was on the bench. Claudio Bravo and Benjamin Mendy remain on the sidelines and will for a long time yet, while David Silva is expected back at the end of the year. Several youngsters, including Eric Garcia, trained with the first team on Monday and could be considered, but Guardiola has plenty of options from his senior squad despite his injury claims (unless some are not being reported). Guardiola stood by his ‘cup goalkeeper’ in the last round against Premier League side Fulham, so we assume Aro Muric will again get to experience a match against top-flight opposition. At the back – oh boy. Pep didn’t want Walker to play more than 45 minutes at Hoffenheim, so unless Danilo is fit (which would be perfect timing), he has a decision to make. John Stones as a right-back didn’t work, but what options are there? Luke Bolton impressed in pre-season, but has had injury problems and is just finding his feet against for the EDS. We’re not as creative as Pep so we’re going to go with Kyle Walker starting then being taken off if the Blues are in a strong position. At left-back, expect the return of Oleksandr Zinchenko. In the centre of defence, Pep likes to reserve his Stones/Laporte combo for the toughest games when both are fit, rotating them in and out of other matches. Laporte took a couple of heavy blows to the head on Saturday, while Stones was an unused substitute, so we’ll go with John Stones alongside Vincent Kompany – two in, two out from the weekend. What a luxury, and Pep could also consider the promising Philippe Sandler for games like this. Expect Fernandinho to play no part against Leicester, with Fabian Delph our pick for the holding role. Pep declared that Kevin De Bruyne will play against Leicester to regain match fitness and we assume that means the flame-haired maestro starts. 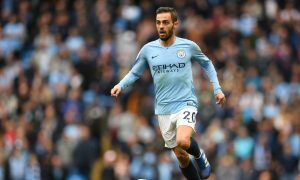 That leaves Phil Foden, as we reckon Bernardo Silva’s form has dipped and he needs some rest, while Gundogan has also played 90 minutes in City’s last two games and could also do with a breather. One of the big questions for the front three is will Brahim Diaz play? He has one foot out of the door and it’s hard to know how Guardiola’s mind works in a situation like that. Given that Brahim appears to have decided his future is away from City and instead at Real Madrid, we can see him on the bench with Riyad Mahrez and weekend sub Raheem Sterling starting. With Brahim on his way out, there may be an opening for someone like Rabbi Matondo to appear in these games soon. That leaves the last big decision: Jesus or Aguero? Aguero needs minutes after injury but Jesus has finally found some goal scoring form and for that reason we’re going for Gabriel Jesus to start up front with Aguero appearing later on. The bench for cup games is something of a lottery. We’re going for an unimaginative ‘strong’ bench, but would hope to see one or two from Sandler, Eric Garcia, Bernabe, Gomes, Bolton and Felix Nmecha: Ederson, Nicolas Otamendi, Aymeric Laporte, Ilkay Gundogan, Bernardo Silva, Brahim Diaz and Sergio Aguero. Even with Fernandinho (who should watch this game on Sky Sports with his feet up) and Leroy Sané rested, it’s a fantastic bench.